(a) Good academic record with atleast 55% of the marks or an equivalent grade of B in the 7 point scale with letter grades O,A,B,C,D,E and F at the Master’s Degree level in the relevant subject from an Indian University or an equivalent degree from a Foreign University. (b) Knowledge of Hindi/Sanskrit upto Matric standard or higher education. (C) “National Eligibility Test (NET) conducted by the University Grant Commission, Counsel of Scientific and Industrial Research or similar test accredited by the University Grant Commission like SLET/SET shall remain the minimum eligibility condition for recruitment and appointment as Assistant Professor in Colleges: Provided that the candidates, who are, or have been awarded a Ph.D. degree in accordance with the University Grant Commission (minimum standards and procedure for award of Ph.D. degree) regulation, 2009 shall be exempted from the requirement of the minimum eligibility condition of NET/SLET/SET for recruitment and appointment of Assistant Professor or equivalent position in colleges. Provided further that NET/SLET/SET shall not be required for such Master’s Programmes in disciplines for which NET/SLET/SET is not conducted”. 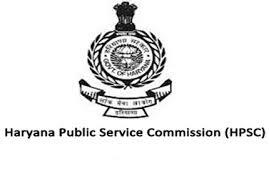 Assistant Professors (524 Vacancies) – Last Date 15 April 2019 (Panchkula, Haryana), Haryana Public Service Commission (HPSC) recruits Assistant Professors posts. Candidates with Ph.D., NET/SLET/SET qualified can apply.